We make it our duty to insure your entire old computer and IT equipment is safely recycled and nothing will go into landfill. By recycling your old computers, servers, printers, laptops, monitors, hard drives etc... you are cutting down on the resources of using precious metals such as Silver, steel and Aluminium. Return a Toner recycling and disposal services include: laptop disposal and recycling, computer disposal and recycling, monitor disposal and recycling, printer disposal and recycling, cable disposal and recycling, PC disposal and recycling, computer equipment recycling, recycling old IT equipment, IT recycling and computer waste disposal. Return a Toner can give you the assurance all your products will be collected securely and fully recycled with accordance with WEE directive. We will also provide you with a Duty of Care as well as all the Certificates needed to ensure you meet your Quality Assurance requirements. 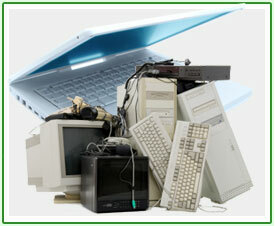 If you require recycling for your any of your old IT equipment, please click here for an online quote. Alternatively you can contact us on 01908 635330 and we will happily assist you.